As much as you interact with clients and your staff on a day-to-day basis, the fitness industry can sometimes be an isolated space where you don’t get a chance to network and learn from other business owners like yourself. Have you ever wondered who your fellow studio owners are and how they got into the fitness industry? 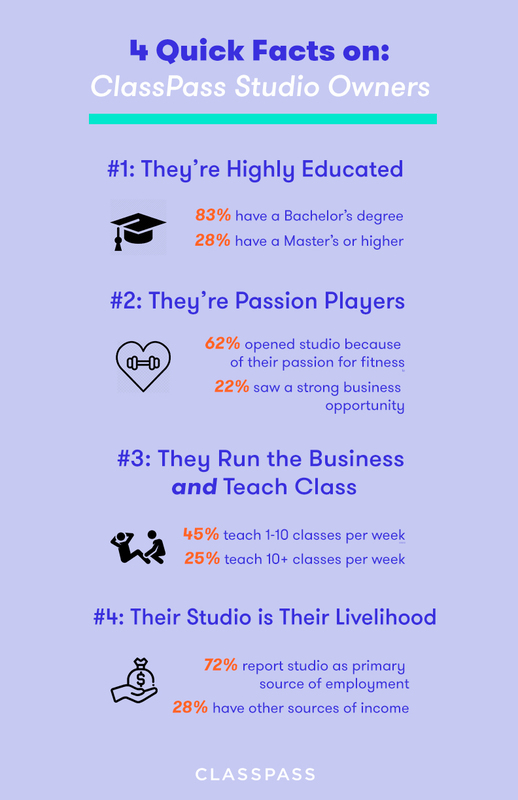 Read more: How Many Classes Should Studio Owners Teach? Thanks to our partners for participating in the survey! We’re grateful to work with you as you make the world a more active and healthy place. Want more business owner insights and stories? Check out the Resources tab above for studio spotlights and helpful tips from industry leaders. In addition, RSVP for one of our upcoming In Session events to connect with more studio owners in your area.